Riders and skiers competed in the seventh annual Silverton Skijoring on Feb. 13, 2016. 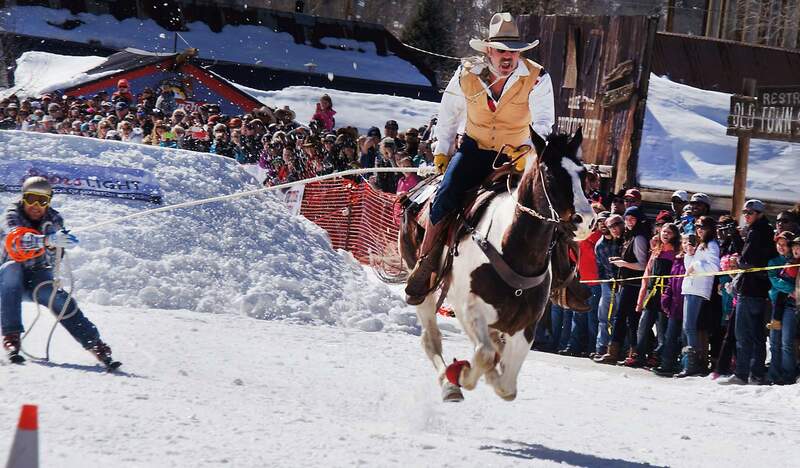 The Silverton Skijoring races will be held Feb. 16 and 17 on Blair Street in Silverton. In addition to traditional open, sport and novice classes, a wild “Fat Boy” class has been added this year for slightly older and slower horses, riders and skiers. The purse this year is $10,000, and there will be championship buckles and other prizes available to participants. Races will begin at noon each day. Early registration, along with live entertainment by Lacey Black, will be from 6 to 8 p.m. Feb. 15 at the Grand Imperial Hotel. Race-day registration will be from 7:30 to 9 a.m. both days at Sage Hen Cafe on 12th Street. Admission for spectators is free, but donations are always welcome. Entry fees are $50 per entry per day for open, sport and novice classes and $10 per day per team for Fat Boy class riders. For more information, visit www.silvertonskijoring.com or call (970) 744-9446. For safety reasons, dogs are not allowed at the event.